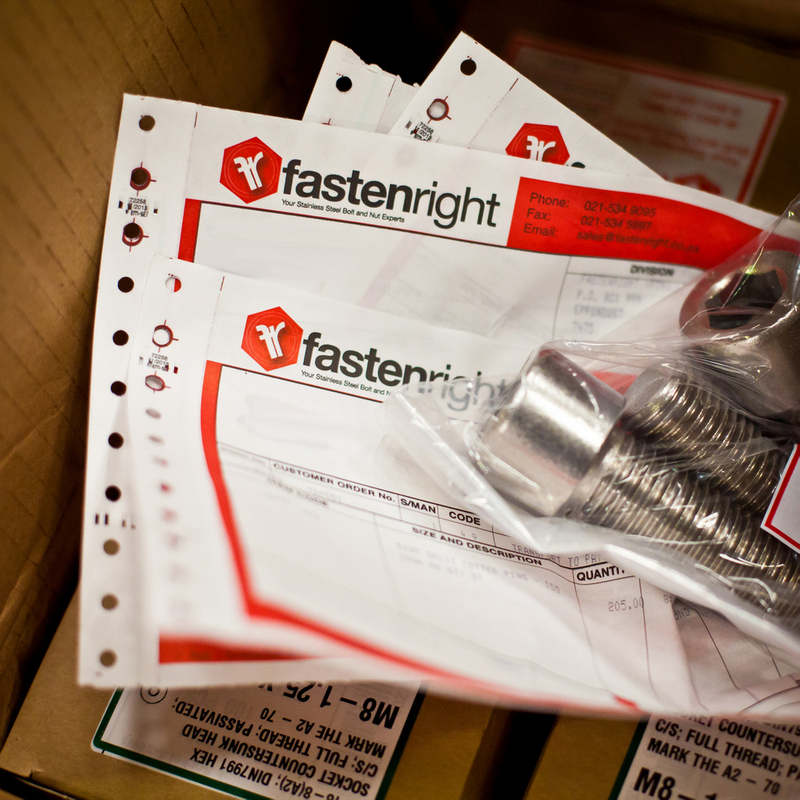 Fastenright’s mission is to become the best stainless steel Fasteners distributor in South Africa. We want to add value to our customers by delivering service excellence through Brilliance. To build long term relationships with our employees, customers and suppliers. Our vast experience and excellent relationships with our suppliers in Europe and the Far East put us in a unique position to source any fastener in any material. Put us to the test. Non-stainless steel enquiries are also welcome. All our products are imported from approved suppliers, which adhere to the highest international quality standards. Material certificates are available on request. We manage our three stock warehouses with Boltpac®; a unique software system that was initially developed for fastener distributors. This software allows us to efficiently and precisely manage our large quantity of stock to ensure we fulfill your orders quickly and accurately. The success of this software has resulted in its successful integration within the pipe, paper and metal manufacturing industries. The most popular type of stainless steel in the marine environment is grade 316. With lowered chromium content, increased nickel and molybdenum added to the mixture, the material becomes more resistant to chlorides. That's why grade 316 stainless is often used in more corrosive environments where the material will be exposed to chemical, solvent or salt water corrosion and makes it the preferred material for marine construction. Please enquire with our sales department for different grade 316 fasteners we can offer. We are very proud to supply South Africa's largest boat builder with all their stainless steel fastener requirements and have done so for many years. They pride themselves on being an international leader in the manufacturing of top-quality sailing and power yachts. Therefore, the supply of top-quality, reliable and non-corrosive fasteners play an important role in helping them meet their objectives. We are proud to stock one of the widest ranges of marine grade 316 stainless steel fasteners for the South African maritime transport and marine manufacturing industry. These fasteners are used in a broad range of applications ranging from harbour, waterfront and dock construction to bridge and boat building.